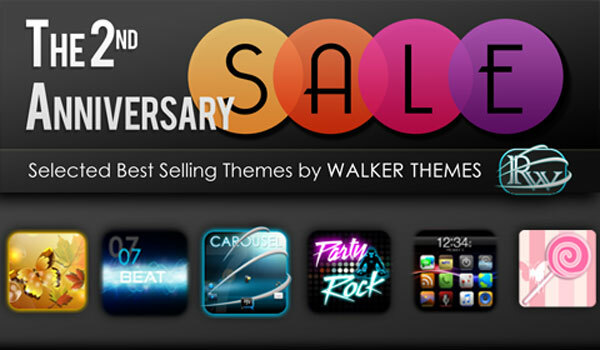 Walker Themes celebrate their 2 year anniversary with a sale on select best-selling themes! What better way to start the fall season then with a theme sale. Walker Themes let us know that this month marks their two year anniversary. As a thank you to their fans and theme lovers for supporting them they have placed six of their popular designs on sale for a limited time. Each one supports a variety of devices and ranges from the cute and creative to stylish and functional. Whether you want to turn your BlackBerry into a replica of iOS, ring in the fall season with a fresh autumn look or in the mood to party, Walker Themes' quality designs appeal to everyone and their eclectic tastes. From now until September 29, all of these designs are on sale for only $.99. If you are a theme junkie then this is one sale you do not want to pass up. To download, simply click on the individual links above or the BlackBerry App World promotion link below. Be sure to drop us a line in the comments letting us know which one is your favorite and to congratulate Walker Themes on this important milestone.